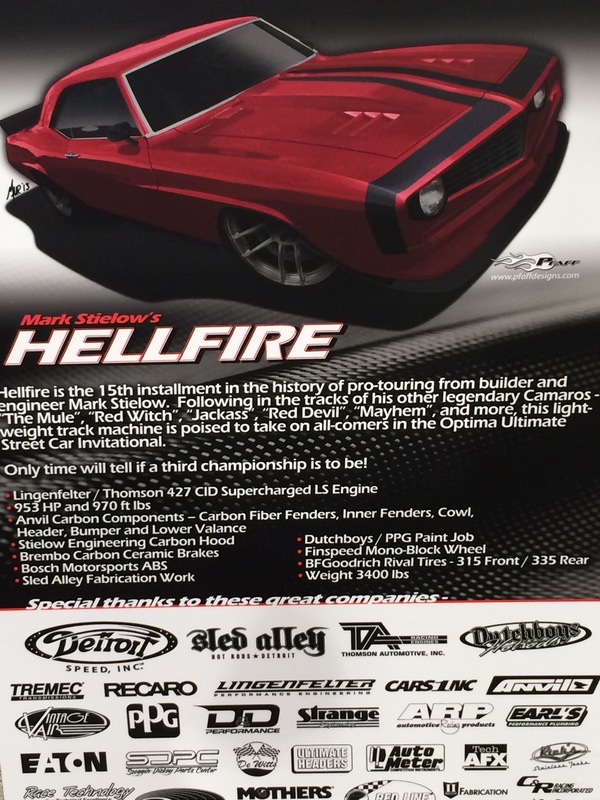 Optima Batteries has invited the eminent Mr. Mark Stielow to compete in the 2014 Optima Ultimate Street Car Invitational. The race will pit the world’s best-performing street-legal cars against each other on the Las Vegas Motor Speedway, November 8-9. General Motors Program Engineering Manager Mark Stielow is a legend in the Pro Touring genre of street car builds, largely because he helped to originate it. He has raced many vintage Chevrolet Camaros, each one updated with modern suspension, drivetrain, and brake components to give them performance comparable to – or exceeding that of – a modern performance car. That is the very definition of a Pro Touring car: a classic muscle car updated to race like a monster, even by today’s elevated standards. It’s also worth noting that the General Motors engineer has won the Ultimate Street Car Invitational twice before. 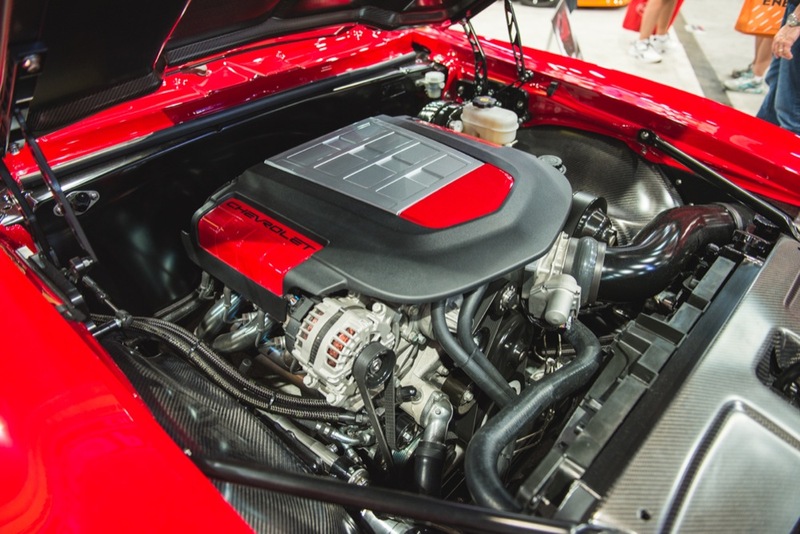 Lingenfelter / Thompson Supercharged 427 cubic-inch LS, making 953 HP and 970 ft-lbs! This build, named “Hellfire,” is very much in the same vane as his previous builds, including the famous “Red Devil” Camaro that took down a contemporary Camaro ZL1. Only, the Hellfire puts out an astonishing 197 HP more than that car, while weighing about 250 pounds less, thanks in part to all the carbon fiber. In the 2014 Optima Ultimate Street Car Invitational, Mr. Stielow will find himself pitted against a lot of equally impressive, mostly non-Pro Touring street monsters, including a 1,000 HP Volkswagen GTI, a 2011 Lamborghini Gallardo, and a 2011 Porsche 911 GT3 RS. We wish him the best, largely because we would love to see a third overall victory for the bowtie brand’s brilliant, original pony car. Please note this mans name. He is the secret weapon at GM today. You will hear much more about Mark as time goes on. While I agree that Mr.Stielow has contributed a great deal to the pro touring scene, I personally believe that John Moss laid the foundation for the modern performance side of Chevrolet, even though he’s been retired for a few years now, you can’t dispute the success of the performance program that he was in charge of. I was lucky enough to get a first hand account of some of the prototype vehicles he was involved with , including some of the vehicle’s sold at Barrett Jackson a few years ago. John Moss was the driving force behind some of the most influential performance cars that Chevrolet had to offer for many years. John was a great promoter on performance in an era many inside GM really did not care. He kept it alive. But it was the people under him that really did the work like John Heinricy, Tom Goad and many others who dd the real work on these cars. Many times the engineers hands were tied with low budgets and limits to what they could do but they at least kept it alive. Today guys like Steilow and others are engineers that have been empowered in ways that GM engineers have not been empower for decades. They are more open to doing things than even in the 60’s when Vince Piggins had to hide GM’s racing support. Mark is a name that will be very prominent in the future. What he does for GM is much more than what you read about in magazines. He is one of the people that came out of the GM Performance Division that are now able to effect change in all models not just fix a select few. While many thought the disbanding of the division was a major mistake they failed to understand these folks were destine to impact the entire GM line up. As for Moss he did do a lot but don’t forget he also was advancing the work Jim Perkins before him had started. Keep in mind Mark is just one part of this whole machine. There is a massive group of engineers that are ding much to make this happen. Tadge Junture and Al Oppenheiser are also two others along with many others that could be named but you would not recognize them. Also do not forget others like Scott Settlmire who over saw the F body program for years and his efforts to help bring back the Camaro They do not call him the F bodfather for nothing. With out his efforts it would be safe to say there would be no Camaro today. At times I think they brought it back just to shut him up. He is a real hero that so few know about outside Camaro circles. The new Z/28 only hints to what we will see. When Lutz came to GM he told the engineers he had their backs and they gave us things like the ZR1 even in the damaged culture of the old GM. We today will see some amazing things. We should see 1LE like performance in the next SS but with a ride fit for a daily driver. Just as the present Z06 is delivering 10 second 1/4 mile times and 60 to 0 stopping in 99 feet then next Camaro will shock many. Think about this. Mark just took the old Zeta and fixed some things that have made this platform do things never imagined it could do. Now give him a new platform with a lot of investment from Cadillac in it to do a new Camaro and just watch what happens.